President Donald Trump plans to sign a flurry of executive actions on immigration today, traveling to the Department of Homeland Security to highlight his committment to border security. During the campaign, Trump repeatedly promised to build a “big beautiful wall” on the southern border. His executive actions today will likely direct existing federal funding passed by Congress for border security to start construction. Trump’s executive action will likely restrict immigration from Syria, Iraq, Iran, Somalia, Sudan, and Yemen — all countries that are hotbeds of radical islamic terrorism. Reuters reports that the restrictions will include a “multi-month ban on admissions from all countries” until the vetting process for immigrants can be strengthened. 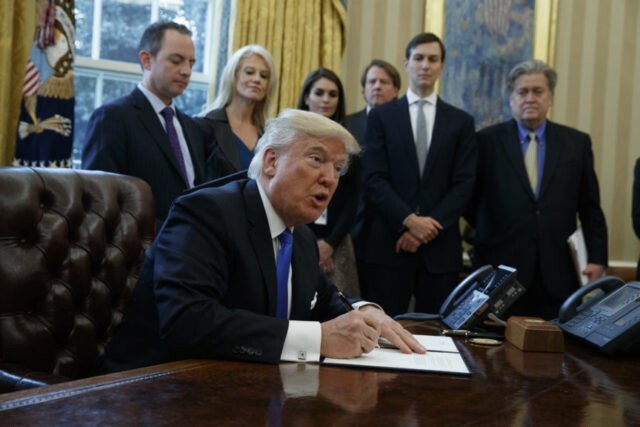 Trump will likely create exceptions to his immigration ban for Christians leaving Muslim-majority countries, according to the Associated Press, if they are fleeing religious persecution. Trump will likely challenge sanctuary cities for their refusal to cooperate with federal officials to enforce immigration laws. According to the Washington Post, Trump plans to meet with the angel moms on Wednesday — mothers who have lost a child to crimes committed by illegal immigrants. Trump promised to revoke former President Obama’s DACA and DAPA executive actions on immigration, but White House aides have signaled that the president will not act immediately. “I think he’s continuing to make sure that his cabinet level team starts to organize and create a plan to move forward with respect to that issue, and that’s where we are right now,” White House press secretary Sean Spicer explained on Tuesday to reporters.